When you want an egg noodle that cooks perfectly every time serve Light 'n Fluffy® — America's favorite egg noodle! 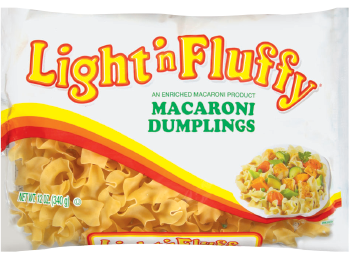 Light 'n Fluffy® is part of the New World Pasta family of brands, a leading dry pasta manufacturer in the United States. Macaroni Dumplings are small wavy pasta that is best in soup, entrées and side-dishes or oven bakes. Macaroni Dumplings go great with cream or cheese sauces, gravy, light tomato sauce or simple butter (or vegetable oil) tosses. CONTAINS WHEAT. MANUFACTURED IN A FACILITY THAT USES EGGS.